Not to be confused with Astor Row. Astor Place is a one-block street in NoHo/East Village, in the lower part of the New York City borough of Manhattan. It runs from Broadway in the west, just below East 8th Street; to Lafayette Street, ending at Alamo plaza. "Astor Place" is also sometimes used for the neighborhood around the street. It encompasses two plazas at the intersection with Cooper Square, Lafayette Street, Fourth Avenue, and Eighth Street – Alamo Plaza and Astor Place Station Plaza. It was named for John Jacob Astor (at one time the richest person in the United States), soon after his death in 1848. A $21 million reconstruction to implement a redesign of Astor Place began in 2013. Astor Place was once known as Art Street. From 1767 through 1859, Vauxhall Gardens, a country resort, was located on this street. The area belonged to John Jacob Astor, and Astor Place was renamed after him soon after his death, in 1848. In 1826, he carved out an upper-class neighborhood from the site with Lafayette Street bisecting eastern gardens from western homes. Wealthy New Yorkers, including Astor and other members of the family, built mansions along this central thoroughfare. Astor built the Astor Library in the eastern portion of the neighborhood as a donation to the city. Architect Seth Geer designed row houses called LaGrange Terrace for the development, and the area became a fashionable, upper-class residential district. This location made the gardens accessible to the people of both the Broadway and Bowery districts. Astor Place was the site of the Astor Opera House, at the intersection of Astor Place, East 8th Street, and Lafayette Street. Built to be the fashionable theater in 1847, it was the site of the Astor Place Riot of May 10, 1849. Anti-British feelings were running so high among New York's Irish at the height of the potato famine that they found an outlet in the rivalry between American actor Edwin Forrest and the English William Charles Macready, who were both presenting versions of Macbeth in nearby theatres. The protest in the streets against Macready became so violent that the police fired into the crowd. At least 18 died, and hundreds were injured. The theater itself never recovered from the association with the riot and was closed down shortly afterwards. The interior was demolished, and the building was turned over to the use of the New York Mercantile Library. From 1852 until 1936, Astor Place was the location of Bible House, headquarters of the American Bible Society. In the mid- to late-19th century, the area was home to many of the wealthiest New Yorkers, including members of the Astor, Vanderbilt, and Delano families. Editor and poet William Cullen Bryant, and inventor and entrepreneur Isaac Singer lived in the neighborhood in the 1880s. By the turn of the century, however, warehouses and manufacturing firms moved in, the elite moved to places such as Murray Hill, and the area fell into disrepair. The neighborhood was revitalized beginning in the late 1960s and 1970s. 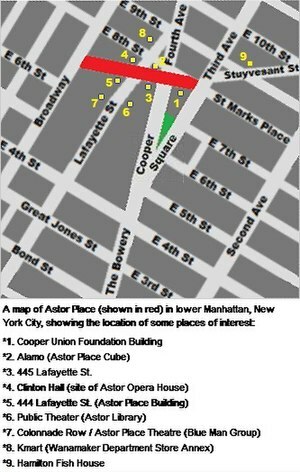 The New York City Department of Transportation's "Reconstruction of Astor Place and Cooper Square" plan calls for some changes to be made to Astor Place beginning in 2013. The street itself will end at Lafayette Street, and will not continue to Third Avenue, as it does currently. This will allow the expansion of the "Alamo Plaza", where the Alamo Cube is located, south to the southern sidewalk of Astor Place between Lafayette Street and Cooper Square, and the creation of an expanded sidewalk north of the Cooper Union Foundation Building. The Astor Place subway entrance plaza will also be redesigned, and Fourth Avenue south of East 9th Street and the western part of Cooper Square is scheduled to be converted to be used by buses only, with a new pedestrian plaza created on Cooper Square between East 5th and 6th Streets. The traffic pattern of the area will change significantly, with Astor Place from Lafayette Street to Third Avenue becoming East Eighth Street eastbound, and the current bidirectional Cooper Square bus lane becoming northbound-only. The $16 million project was first proposed in 2008, then abandoned and re-proposed in 2011. Construction started in September 2013. The current 299-seat Off-Broadway Astor Place Theatre, has been located in the landmark Colonnade Row on Lafayette Street, half a block south, since 1969. It was known for premiering works by downtown playwrights like Sam Shepard, but since 1991 has been the home of Blue Man Group, which now owns the theatre. 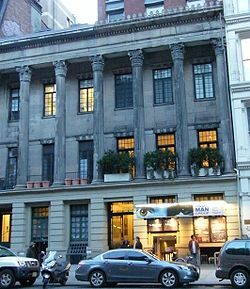 The Joseph Papp Public Theater (home to the New York Shakespeare Festival) is located across the street in the former Astor Library building. The trapezium-shaped traffic island in the center of Astor Place is a popular meeting place and center of much skateboarding activity. The island is most notably home to Tony Rosenthal's sculpture "Alamo", known popularly as "The Cube", which consists of a large, black metal cube mounted on one corner. Installed in 1967 as part of the "Sculpture and the Environment" organized by the New York City Department of Cultural Affairs, the Alamo Cube has since become a popular meeting place in the East Village. The sculpture can be spun on its vertical axis by one person with some effort, and two or more people without trouble. In 2003, the cube was the subject of a prank played by the ATF squad (All Too Flat) in which it was turned into a giant Rubik's Cube. The members of the organization were careful with the prank, as they didn't want to be destructive. The cube stayed up for about 24 hours before city maintenance removed the painted cardboard panels from the sculpture. On March 10, 2005, the Parks Department removed the Cube for maintenance. The original artist and crew replaced a missing bolt, and made a few other minor repairs. A makeshift replica of PVC tubes named the Jello Cube in honor of Peter Cooper was placed in its stead. As of November 2005, the Cube returned with a fresh coat of black paint, still able to spin. In 1860, Abraham Lincoln came to the attention of the fledgling Republican party with his Cooper Union Address. Given in The Cooper Union's Great Hall, the 'Right Makes Might' speech examined federal control of slavery and the thoughts of the signers of the Constitution. Cooper Union also housed one of the first free public libraries. One of the original libraries making up the New York Public Library, the Astor Library was housed in the Astor Library Building. The building is home today to Joseph Papp Public Theater. The Astor Place subway station (4, ​6, and <6> trains) is among the original 28 subway stations, and is on the List of Registered Historic Places in New York. The tile mosaics on the station platform feature beavers, a tribute to John Jacob Astor, whose fortune was founded in beaver-pelt trading. The Peter Cooper Memorial by Augustus Saint Gaudens is one block south on Cooper Square. 21 Astor Place (also known as "Clinton Hall" and "13 Astor Place") stands on the site which was once the Astor Opera House. After the Astor Place riot, the building was turned over to the New York Mercantile Library, which used it until 1890, when they tore it down and built the current 11-story building. The Library left in 1932, and the building became the headquarters for a union. It has now been redeveloped into modern condominiums behind the original 19th century façade, an example of the technique of facadism. The Cooper Station Post Office, built in the 1920s, is just three blocks north. ^ a b "Major Astor Place Reconstruction Is Actually Starting", Curbed. September 16, 2013, by Jessica Dailey. Retrieved September 9, 2014. ^ Dunlap, David W. (21 October 2015). "New York Says Farewell to American Bible Society, and Its Building". New York Times. Retrieved 23 October 2015. ^ "See Updated Designs For Long-Awaited Astor Place Revamp", Curbed. September 26, 2013, by Jessica Dailey. Retrieved September 9, 2014. ^ a b Moynihan, Colin (November 19, 2005). 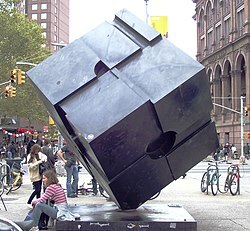 "The Cube, Restored, Is Back and Turning at Astor Place". The New York Times. Retrieved 2009-03-18. ^ Grimes, William (August 1, 2009). "Tony Rosenthal, 94, Sculptor of Public Art". The New York Times. Retrieved 2010-07-17. ^ "Astor Place Cube Will Stay in Place". The New York Times. November 23, 1967. p. 33. Retrieved 2010-07-17. ^ Bleyer, Jennifer (January 30, 2005). "A Famous Cube Puzzles Its Biggest Fans". The New York Times. Retrieved 2010-07-17. Wikimedia Commons has media related to Astor Place. This page was last edited on 25 September 2018, at 23:53 (UTC).